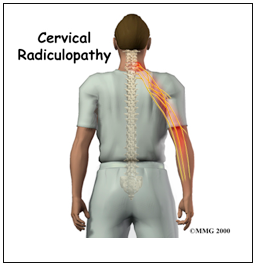 Cervical radicular pain has to be differentiated from cervical radiculopathy. In radiculopathy there is objective sensory or/and motor loss. These two entities should not be confused, as it usually happens. Radicular pain is a symptom induced by ectopic excitation, while radiculopathy involves also neurological signs, such as sensory or/and motor changes. The two disorders may co-exist and have the same causes, e.g. intervertebral foraminal stenosis, disc herniation, infection and other inflammatory conditions. There is also the case of patients initially suffering from radiculitis (nerve root inflammation) that later on progresses into radiculopathy. The most common cause of acute and subacute (6-12 weeks) cervical radicular pain is cervical disc herniation . The most common cause of chronic (over 3 months) cervical radicular pain is the formation of adhesions around a nerve root and its chronic irritation. Adhesions may form as a result of acute inflammation due to disc herniation or after spine surgery. Other causes may be: spinal canal stenosis, intervertebral foraminal stenosis (at the point where the nerve root exits), spondylolysthesis, syringomyelia and radiculitis following radiation or chemotherapy. Pain originating from the fourth cervical root (C4) is localized in the neck and suprascapular region. Pain from the fifth cervical root (C5) radiates to the forearm, whereas pain from the sixth and seventh root (C6 and C7) extends to the neck, shoulder, forearm and hand. The diagnosis is based on the history, clinical examination and supplementary tests. 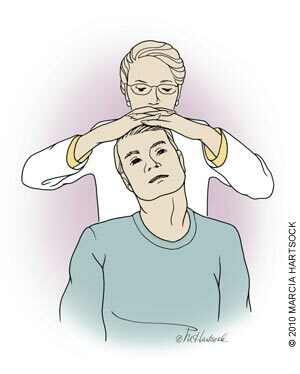 The classical neurological examination includes sensory, motor and reflex examination. 1. Spurling test. With patient’s neck in extension and head turned to the side of the painful shoulder, the clinician exerts vertical pressure on the head. Induced shoulder or forearm pain is an indication of probable compression of the cervical spinal root. 2. Shoulder adduction test. 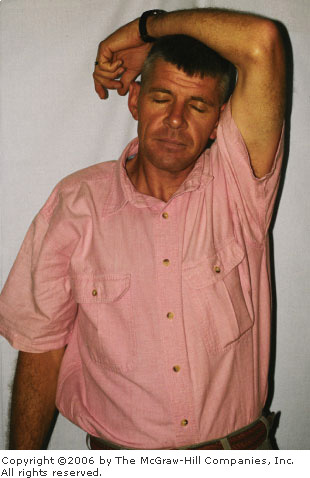 The patient elevates the arm above the head. Reduction or elimination of pain indicates probable cervical radicular origin. 3. Vertical head traction test. 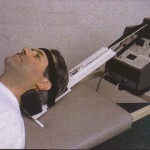 The patient lies on the back and the clinician exerts vertical head traction equal to about 10-15 kilos. Reduction or elimination of pain indicates probable cervical radicular origin. The most commonly used supplementary examinations are radiological evaluation, electrophysiological testing and diagnostic selective nerve root blocks. Plain X-ray examinations are used mainly to rule out other serious primary pathology, such as tumor, infection and vertebral fracture. Electrophysiological tests include nerve conduction and electromyography (EMG). These are useful when there is suspicion for nerve defect but they do not provide any particular information regarding pain. Before setting the final diagnosis, it is imperative to investigate and exclude any other serious primary pathology, such as tumor, infection and vertebral fracture. A tumor causing brachial pain of neuropathic type is the Pancoast tumor, which is an apical lung tumor that may compress the subclavian artery, phrenic nerve, brachial plexus and sympathetic ganglion, causing the so-called Horner syndrome. Metastases from some primary condition in the cervical spine may also cause brachial pain. For the treatment of acute and subacute condition, anti-inflammatory drugs are recommended but only for a short period to avoid potential severe cardiovascular and gastrointestinal complications that might occur. The chronic condition is treated with drugs administered in neuropathic pain, such as antidepressants (amitriptyline), antiepileptics (carbamazepine, oxcarbazepine, gabapentin, pregabalin). Although there are not yet studies establishing their efficacy in cervical radicular pain, this pain falls in the category of neuropathic pain and drugs mentioned above are definitely indicated. In case of resistant pain to therapy, mild opioids may be added, such as codeine and tramadol. 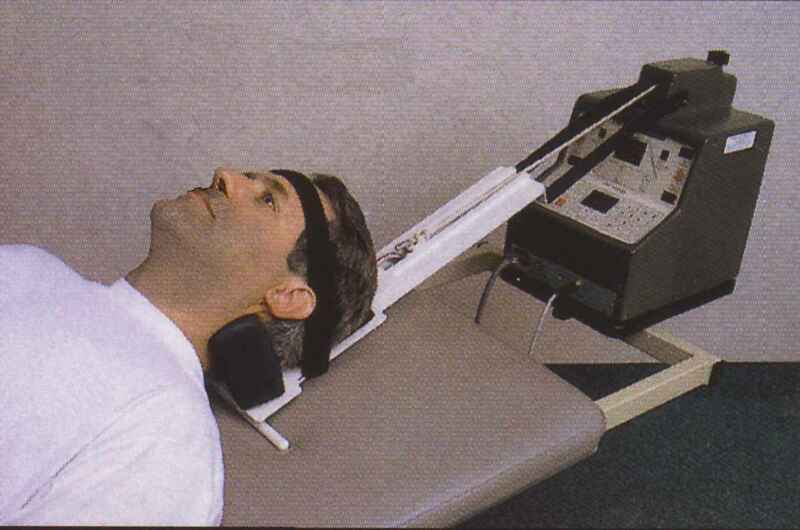 In one of Cochrane’s reviews, the value of spinal traction application was evaluated in the treatment of cervical pain with or without radicular pain and , as regards the efficacy of the method, there was no evidence either to support or reject it. Multifactorial rehabilitation is recommended with physical therapy and chiropractic manipulations. In case pain persists or the patient does not tolerate the potential adverse events of drugs that s/he should take on a long-term basis and before deciding to administer any strong opioids, it is recommended to apply innterventional pain therapies. Before starting pharmaceutical treatment on a long-term basis, many patients choose a minimally invasive therapy which intervenes straight to the origin of pain, in order to avoid chronic addiction to drugs with several side effects. In many cases, the ideal treatment is achieved with combination of pharmacotherapy and interventional techniques. When the disease is in its acute or subacute form, cervical epidural corticosteroid injection is indicated. The technique used, is the posterior translaminar approach, whereas the transforaminal epidural injection is avoided due to high risk of severe complications, as opposed to the lumbar spine where the transforaminal approach is preferred. Systematic research worldwide leads to the conclusion that the cervical epidural corticosteroid injection is significantly effective in the treatment of acute and subacute cervical radicular pain and should always be applied before surgery decision. When the disease is in its chronic form -as it usually happens after spine surgery or following the acute and subacute phase of radiculitis from disc herniation that had been undertreated with conservative therapy- neuroplasty (adhesiolysis) with Racz catheter is indicated. The American Society of Interventional Pain Physicians (ASIPP) published evidence-based guidelines for invasive techniques in the management of chronic spinal pain. According to these guidelines, there is strong evidence indicating the efficacy of neuroplasty with corticosteroids in the short and long-term control of pain in refractory radiculopathy and neuropathic spinal pain. Randomized controlled studies have demonstrated the efficacy of PRF applied on the dorsal spinal root ganglion (DRG) of the cervical spine. According to evidence-based medicine, the application of the method in cases of chronic cervical radiculitis is strongly recommended. It is a neuromodulatory therapy, which is used in case all other less invasive methods fail. Its efficacy in treating chronic resistant neuropathic pain is significant. 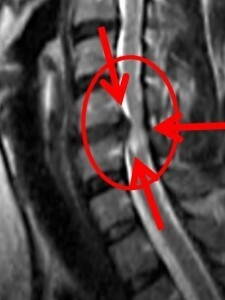 Surgery is indicated in case the spinal cord is severely compressed with high risk of causing myelopathy with permanent severe irreversible neurological impairment. In a randomized study, comparison was made between surgical and conservative treatment and it was found that there was substantial improvement in pain 3 months postoperatively. However, one year later there was no difference between the two patient groups. A small randomized study demonstrated that there are no differences in the neurologic outcome between patients who were treated surgically or conservatively. Thus, surgical operation should be limited only to those patients whose neurological condition is so aggravated that the patient is in risk for permanent irreversible neurologic impairment. physicians task force. Chest. 2006;129:174–181. of Chronic Pain Syndromes and Definitions of Pain Terms. 2nd ed. Seattle, WA: IASP Press; 1994.
through 1990. Brain. 1994;117(Pt 2):325–335. 10. Fager CA. Identification and management of radiculopathy. Neurosurg Clin N Am. 1993;4:1–12. radiculopathy. N Engl J Med. 2005;353:392–399. spine in asymptomatic subjects. A prospective investigation. J Bone Joint Surg Am. 1990;72:1178–1184. 13. Teresi LM, Lufkin RB, Reicher MA, et al. support for a central mechanism. Arch Phys Med Rehabil. evaluated by multi-slice computed tomography. Eur Spine J.
M, Mattle H, eds. Neurology. 4th ed (revised and enlarged). L. Patient education for neck pain with or without radiculopathy. Cochrane Database Syst Rev. 2009;1:CD005106. traction for neck pain with or without radiculopathy. Cochrane Database Syst Rev. 2008;3:CD006408. in the management of chronic spinal pain: a systematic review. N. Cervical epidural steroid injection for cervicobrachialgia. 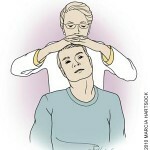 in the management of chronic neck pain. Pain Physician. infusion. Clin J Pain. 2007;23:551–557. outcome after cervical epidural steroid injection. Spine. epidural injection of corticosteroids. Long-term results]. Ann Fr Anesth Reanim. 1995;14:484–488. cervical radiculopathy: a prospective and randomised study. transforaminal cervical epidural steroid injections. Spine. 34. Lee JH, Lee JK, Seo BR, Moon SJ, Kim JH, Kim SH. transforaminal epidural injection. Reg Anesth Pain Med. 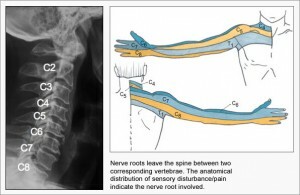 blockade of the right C6-nerve root. Pain. 2001;91:397–399. root therapy. J Neurol. 2004;251:229–231. cervical transforaminal epidural injection: a case report. block: the role of corticosteroids. Spine J. 2004;4:468–474. 42. Beckman WA, Mendez RJ, Paine GF, Mazzilli MA. injection. Reg Anesth Pain Med. 2006;31:282–285. following uncomplicated cervical epidural steroid injection. artery. Acta Anaesthesiol Scand. 2008;52:165–166. epidural steroid injection: case report and review of the literature. J Spinal Cord Med. 2007;30:385–388. spinal cord. J Comp Neurol. 1958;110:75–103. sneak peak at the future. Pain Pract. 2008;8:223–225. 53. Okubadejo GO, Talcott MR, Schmidt RE, et al. vertebral artery. An animal study. J Bone Joint Surg Am. radicular pain. Pain Med. 2006;7:237–242. injections. Reg Anesth Pain Med. 2008;33:190–191. cervical epidural steroid injections: time to stop? 16 • van zundert et al. 57. Owlia MB, Salimzadeh A, Alishiri G, Haghighi A.
injection for lumbar radicular pain. Singapore Med J. Meeting. Rome, Italy: ESRA; 2000;122.
between 40 degrees C and 67 degrees C treatments. Pain. pain: a double blind sham controlled randomized clinical trial. literature available. Pain Med. 2006;7:411–423. or a cervical collar. A prospective, randomized study. Spine. 67. Waldman SD. Interventional Pain Management. Philadelphia, PA: Saunders, W.B. ; 2001.